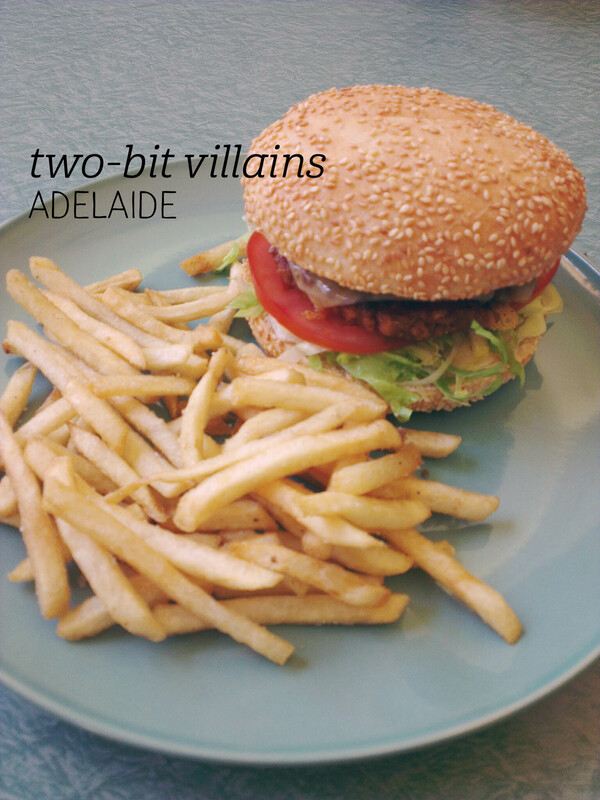 Hey you guys, have you heard about Two-Bit Villains? I am probably a bit slow to catch on, but this soda bar & diner (est. in 2011) is secreted away in the upper balcony of the Adelaide Arcade – and it’s vegan! I was fascinated to try one of their ‘beef’ (soy) burgers and see how it measures up, so on the waitress’s recommendation I ordered the Baron, with the soy patty, lettuce, tomato, cheese and smokey BBQ sauce – plus I added pickles ($12, plus 50c for the pickles). The burger came with fries, and let me tell you, the herbed seasoning they use is actually amazing! When I asked what was in it, I was told it’s the chef’s special, so they’re not giving up any secrets! First bite of the burger is all about the BBQ sauce – yes, it is smokey and has that rich, savoury-sweet thing that a good BBQ sauce should have going on. Yum. The soy patty was delicious, and I’m not just saying that. I really enjoyed the lighter texture, which matched well with the fluffy bun. All the ingredients were fresh and the portion was perfect for lunch, not to mention the friendly service. A lovely experience all around. I’m not the most outgoing person, but I was really looking forward to meeting Bec from Inexplicable Wanderlust in person, after months of reading one another’s blogs. 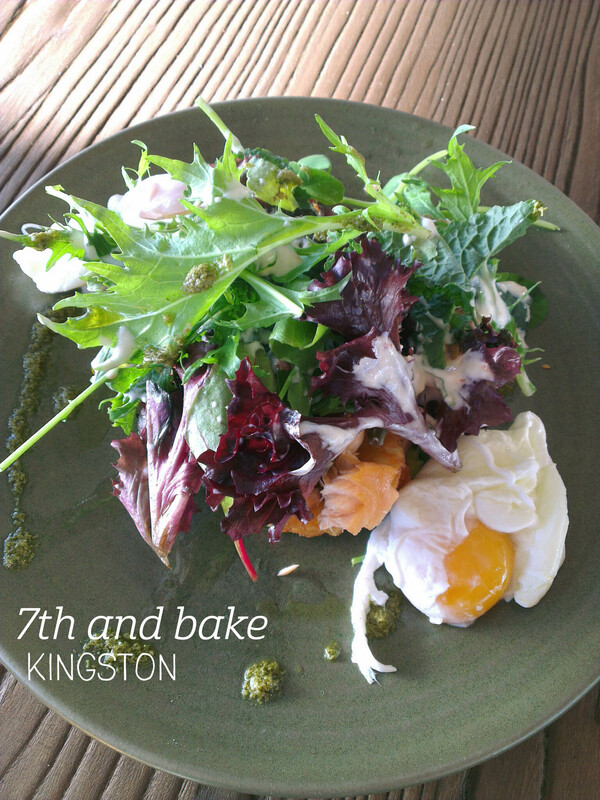 We had breakfast at 7th and Bake, which was drenched in autumn sunlight despite the chilly air. Perusing the menu, I landed on the Hot Smoked Salmon ($19.90), served with smashed avocado, a hash brown, poached eggs, watercress and a honey and lime dressing. The plate was beautifully presented, and we both spent a good few minutes photographing our food unashamedly, as only food bloggers can. The salmon was indeed hot, although the heat seemed to mask some of the smoked flavour. The meat was perfectly cooked, flaking into soft pieces, and the portion was quite large, making it great value for money. The eggs were poached perfectly, and ran nicely into the crisp-on-the-outside, soft-on-the-inside hash brown, one of my favourite breakfast things. The avocado was the only disappointment, tasting more like a lemon-drenched avocado dip than fresh avocado, but otherwise I enjoyed every bite of this meal, not to mention the great conversation. Worth a visit – I hear their pastries are excellent too. 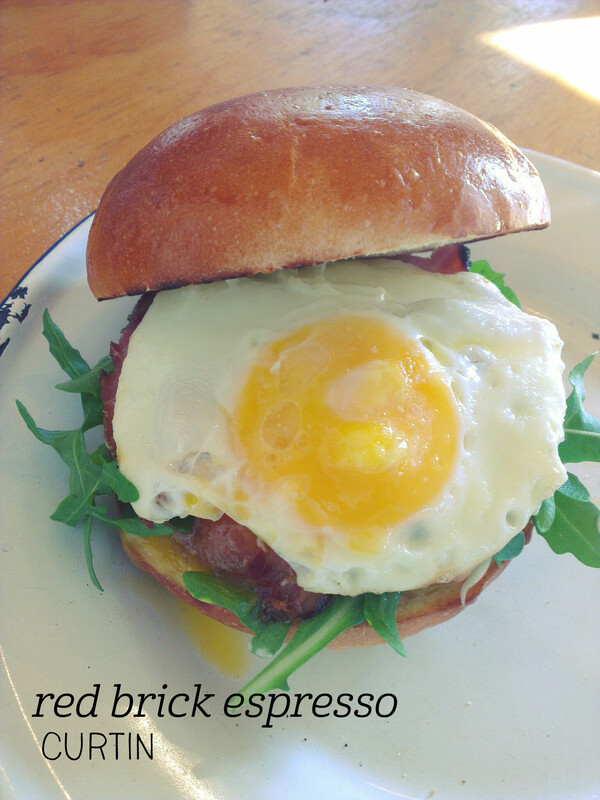 Not being a coffee drinker, Red Brick wasn’t too high on my foodie list, but a friend invited me there for a catch up and so off I went. The brunch menu is actually quite good, with a few breakfasty options and a few lunchy options. I chose a classic fried egg and bacon roll ($10.90), mostly because it was served with kewpie mayonnaise! We sat inside, admiring the texta-art scene drawn on the wall, showing the local shops. I also drooled a bit over the danishes and pastries at the counter, but decided to be good. This time. The roll came out fairly quickly, and I was very happy to see egg yolk oozing down the side (yay!). The toasted brioche bun was quite substantial, and I was pleased by the amount of bacon included in the serve. The bacon was a bit fatty, but there was enough crispy bits mixed in to not be a problem. Rocket is my favourite ‘leafy green thing’, particularly when paired with creamy kewpie, which brings out the sharp bitey flavour of the rocket. Overall this was a nice breakfast, although nothing particularly outstanding. I’d come back to try the lunchy options. Gelatiamo is a lovely little cafe, offering a great range of gelato with about half of the flavours being sorbets (yay!). There’s plenty of seating inside, so we decided to dine in, and were served our choices in cute sundae glasses with long spoons. 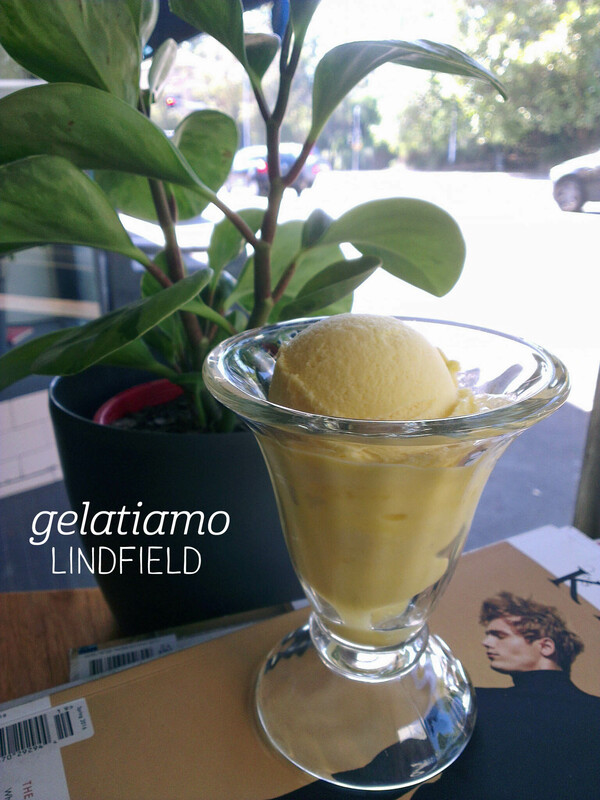 Listed as one of the top 10 gelaterias in Sydney, this was my first visit, so I picked a flavour that can be hard to find – mandarin sorbet ($4.90 for a single scoop). I was surprised by how huge the serving was (dine in is highly recommended) – I would have easily thought of this as a double serve, but Dad’s double was piled up even higher! I had a quick taste of his hazelnut and pistachio choices – both were creamy and nutty, with perfectly smooth textures that didn’t have ‘bits’ in them. I then got stuck into my sorbet. Don’t order this flavour if you like sweet sorbets – the citrus flavour in this sorbet is really intense, but also quite bitter. I found this really refreshing, and the flavor screamed MANDARIN! I could imagine this being a great palate cleanser after a heavy meal – fresh, sharp and delicious. 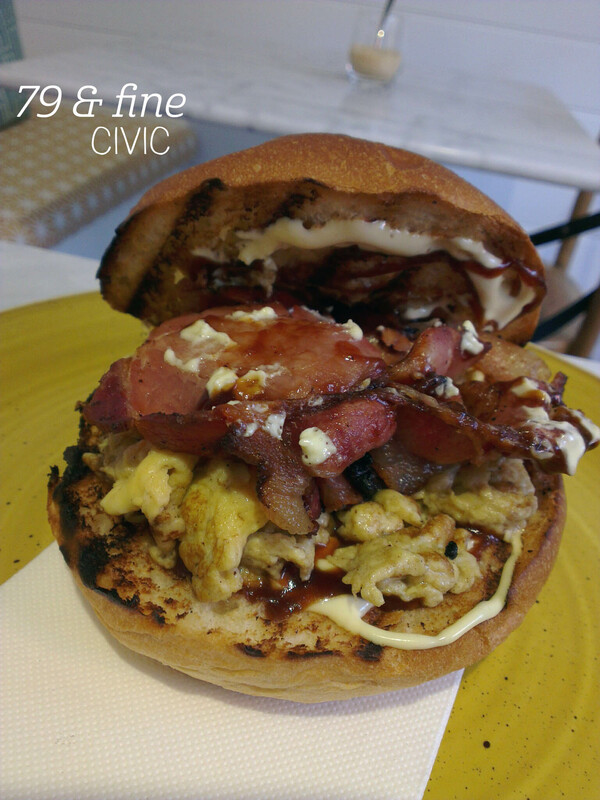 79 & Fine has recently opened in Hobart Place, bringing a flavour of the Hamptons to Canberra. The space is warm and inviting, and I was drawn to the pastry display like a bee to nectar. Mmm. Pastries. Instead, I did the grown up thing and had a bacon and egg roll ($10), plus an orange and apple juice ($7). The staff were really friendly and welcoming, bringing over the concise menu (two breakfast options) on a board for us to choose. When my friends’ orders of smashed avo ($16) came out, I had a bit of order envy (so beautifully presented), but my roll was huge when it arrived. Served on a toasted brioche bun, the roll has “double bacon” and plenty of egg scramble, plus lashings of BBQ sauce and aioli. The ingredients are simple but they work well together in a hearty, comforting way – there’s just enough sauce without it oozing out and the bacon was cooked with the right balance of crisp and tender. I really enjoyed my juice too, with plenty of froth and a crisp, clean orange and apple flavour. I can’t wait until they add the lobster roll to the lunch menu – I’ll be back soon! All good things must come to an end – here’s the last post in what has been a fun #sweetweek. 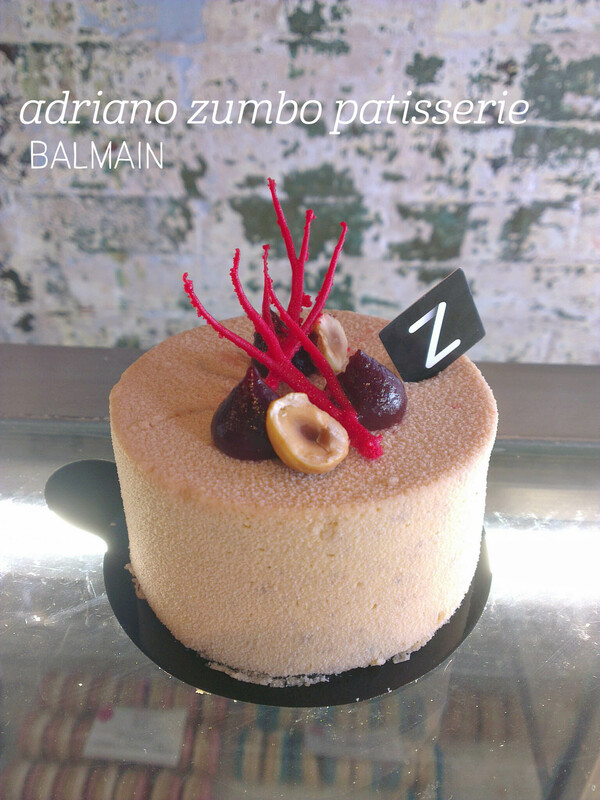 Sadly, Zumbo has closed his Rozelle store, but luckily the tiny outlet at Balmain remains open. We stopped by and tried one of the newer additions to the dessert selection – the Hazelnut Forest, with a hazelnut dacquoise, hazelnut crunch, cherry jam, milk curd, hazelnut mousse and hazelnut spray. Phew. That’s a lot of hazelnut. Firstly, I loved the presentation of this one – something about the sprigs on top reminded me of coral. The fresh hazelnuts and dollops of cherry on top were delightful, as the entree into the perfectly soft hazelnut mousse that surrounds the cake within. For me, this dessert was just like a lighter version of a black forest cake, without the chocolate but with the delicious cherry flavour inside. There’s a lot of mousse surrounding the smaller dacquoise, crunch and jam inside, which was definitely the best bit. I enjoyed the textural contrast here, from the soft mousse to the thick jam to the crunchy base. Mmm. I was surprised at how the lovely tartness of the cherry matched the nutty hazelnut, but also how light the whole dessert was. Highly recommended.